At Carleton, my closest political pals were James Villeneuve, Bob Richardson, Jim Watson and Gordie Brown. I haven’t stayed in touch with the other guys as much, over the years, but I always did with Gordie. Despite our different political allegiances, despite living in different places, we always remained very close friends. He was loyal to me, and me to him. 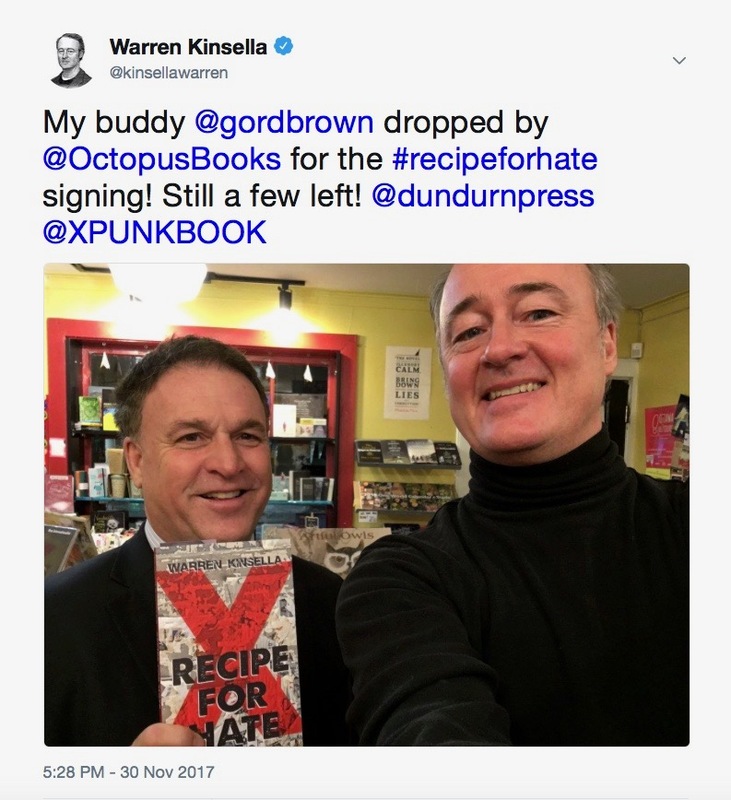 I last saw him on November 30, when he came to my Recipe for Hate book launch in Ottawa. He was the only Ottawa friend who remembered and who came. That was the kind of guy he was. A few days ago, Gordie called me, after visiting James in L.A. I didn’t call him back. I kept putting it off. I was busy. This morning, Gordie died of a massive heart attack. I am in shock and don’t know what to say, other than just two things. One, I loved him as a friend and will miss him as a brother. Two, when you reach a certain age, and your friends call, call them back. Terribly sad. I never met him personally, but shows how precious life is and why you do want to stay in touch with friends as well as enjoy each minute of one’s life as you never know when it will end. God how I wish that all people, as they approach a certain age, would go for an annual physical. Mine is next week. This is so sad and shocking- like Alice F , Jim W and you I was a Carleton grad. I got to know Gord better in our later years when served in the HoC as MPs. He really was a good person and dedicated to his community- while we debated vigorously it was always respectful and constructive. Paul: Gordie was just like you in so many ways. He too was fiercely loyal but in a respectful way. Unfortunately the respect between members of all parties is growing less and less with each passing day. We can agree to disagree but politics should NEVER become personal. When it does we all lose. Just hearing about this now, so very sad – like you, Alice F and Jim W I was a grad from Carleton but I got to know him well as an MP – he was decent, dedicated, fun and most important inquisitive. While we vigorously debated many issues he was always respectful, thoughtful and never arrogant. Sorry for your loss of a school chum, Warren. Condolences to all who knew him. Public life is a stressful experience and those who serve deserve our gratitude on both sides of the aisle. You would think that the Star would give him a more importance place on the website. Preceded by unaccompanied minors and pot delays. Priorities I guess. I was so shocked today by this news. I have fond memories of meeting Gordie in residence at Carleton. We had such fun together and shared a lot of laughs. Through it all, he was always a gentleman. I will miss that smile and just knowing he was there. I too, lived in Renfrew house at Carleton in the early 80’s. Gordie, was such a nice guy. I loved egging him on and encouraging the political or philosophical debates. He never was personal in his verbal sparring, always well prepared and educated on the topics- albeit, not always correct, in my view-but that was the beauty of the engagement. He was engaged, apparently,always. He was also a gentleman. Always. Bye Gord, Thanks for everything. Sorry for your loss Warren…sounds like you did enjoy some great times though so you do have those memories to treasure. Unfortunately, we just never know what the future holds for us. Warren – in one of our last conversations, Gord and I talked about our success in raising money for Fort Henry. And of course, our one dollar ace. (I think we still owe you $1).